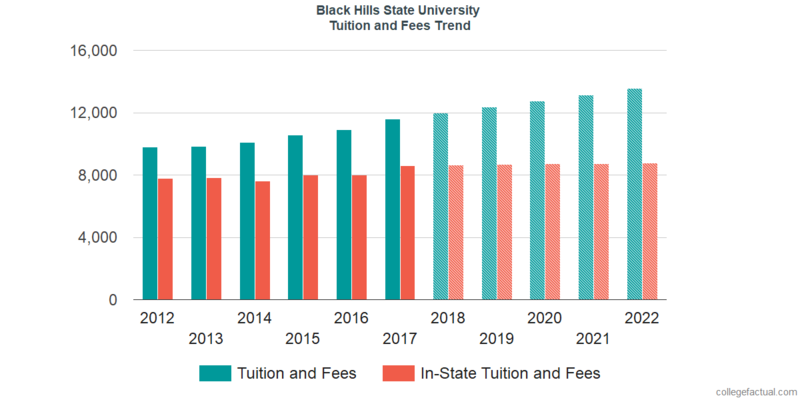 How much does Black Hills State University cost for tuition at this time, and how much are charges forecasted to shift? How does tuition differ from other colleges? Read on to find out. Prepare money wise for your education. Contrast Black Hills State University's tuition and fees to other American universities and colleges. Look for tuition tendencies and increases to find out whether you should expect to set aside more funds for the following few years of college bills. The next table shows how Black Hills State University compares to other colleges nationally, regionally and by state. Tuition and fees at Black Hills State University is significantly lowered for students from South Dakota. Tuition and fees for in-state students is set at $8,602 for the 2017 - 2018 year, a 25.9% discount off the price charged to out-of-state students. Tuition is $7,514 and fees $1,088. Out-of-state undergrads at Black Hills State University spent $11,602 in tuition and fees in 2017 - 2018. Of this total, $10,514 was the expense of tuition and $1,088 the price of fees. View the following table to find 2017 - 2018 academic year costs. How much does Black Hills State University cost part time? Discover Black Hills State University cost per credit hour here. Black Hills State University tuition and fees for out-of-state students increased at a standard annual rate of 3.2% within the last five years. Over that same period, tuition increased by 4.4% and fees increased by 5.5%. Due to this, we predict the price of tuition and fees for this year will be $11,969. At this rate, we estimate the total cost of tuition and fees for a two year degree to be $24,315 and for a four year degree to be $50,192. Remember, this doesn't include other costs such as room and board, transportation, and books. See estimated potential tuition and fees for Black Hills State University students which includes residence based reductions in the following chart. Mainly due to the cost of living as well as other variables, the cost of college is likely to increase each year. For this reason your last year of school may very well be much more than your first year.